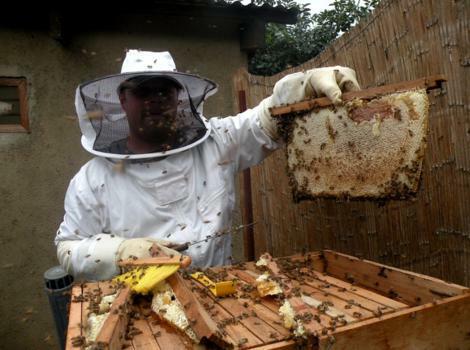 1) Primary swarm occupations - All beekeepers must seek to get primary swarms in their hives. 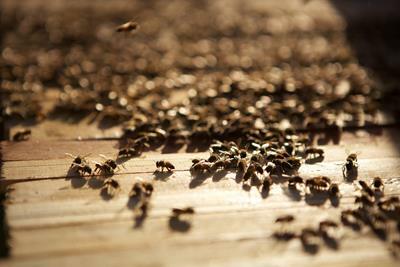 Primary swarms are the first swarms of the season and they can contain up to 30,000 bees. They can build comb rapidly and gather more honey earlier than smaller swarms. Start of swarming season coincides with large amounts of flowers blooming at once. A beekeeper must be aware of when flowers bloom if he /she is to take advantage of the large primary swarms flying at that time. Hives should be baited and in the forest just before swarming season. 2) The importance of ease in raising and lowering hives for inspection and harvest cannot be over emphasized. A system of hooks and wire couplings that unhook and open with little effort should be your goal! 3) While harvesting honey a swarm of returning foragers will collect on the branch where the hive was hanging. These bees should be smoked off the branch before raising the hive back to its original position. If you do not do this, you will crush many bees with the rope used to pull the hive back up. It will deplete your hive of valuable workers and release alarm pheromone which incites the bees to greater anger. 4) Hives should be carried a short distance from their location when harvesting so as to avoid harassment by foragers returning to the site. 5) If bees which are visibly smaller than most in your area enter and occupy your hive they should be cast out. They are most likely Litorea (coastal type honeybees) and will only produce small amounts of honey. After casting them out the hive needs to be moved to a new location or they will re-enter. If they are in your hive, others will not enter as they will give off a smell letting other swarms of bees know that it is occupied. Your hives are valuable and should have only the best, largest swarms of bees in them. 6) For an ideal size Top Bar hive, a beekeeper should make a hive containing twenty to twenty-five 32mm-width bars. The length of the bars is not as important as the width. A good length is between 15 to 19 inches and a good height is 10 inches. The inside area of a hive this size is not too small, or too big. 7) If hives are too large, bees will be harassed by pests like wax moths and small and large hive beetles. They use the unoccupied spaces in the hive to breed and increase their numbers. Large hives also promote high humidity and excessive moisture, as bees are unable to control the spacious environment. 8) Proper bee space is imperative (see Baiting and Placement). 32mm between starter strips and 16mm between starter strips and the walls of the hives should be observed for African bees. noticeably calm them making them easier to work. 10) Hives should be hung at opportune heights so that easy harvesting and rehanging is possible. 11) Position your entryways so they are facing towards the East making the most of the morning light. Hives facing the West will become active a half an hour later each morning. Entrance to log hive after cover was removed. Notice the 'bee space' left between the comb. The bees have not found the bars to be spaced correctly to leave them 'bee space.' They have decided to pull their comb perpendicular to the bars. 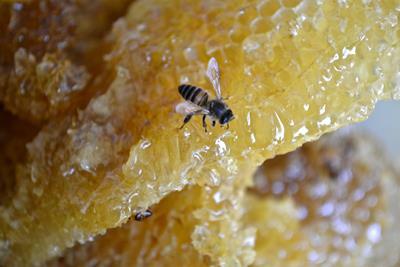 It is a problem harvesting such honey as the bees have drawn their comb across many bars. Ideally each bar should have a comb affixed to it making it possible to harvest or inspect individual combs. All bars on top bar hives should be exactly 32 mm wide. African honeybees on a top bar hive. During harvesting bees will gather both on top of the hive and around the entrance of the hive. The beekeeper needs to be gentle but deliberate in harvesting. The goal is to harvest honey in a short period of time while killing as few bees as possible. The destruction of bees hurts future honey production as well as causes the bees to emit alarm pheromone, which incites anger. The more often you harvest honey the better you will be at balancing these two things.